The complexity of the wine experience is sometimes what makes it intimidating. How is one to know how and when to use terms like “velvety” or “luscious”? Or phrases, like “the body was brilliant, but I especially liked the clean, crisp finish.” Or maybe, “this wine’s earthiness got in the way of its vigorousness…” What’s wrong with “this sure is grapy” or “I like this one. It tastes like sticks”? Isn’t it nice when you can just go into a place, not worrying about checking the cork for whatever you’re supposed to check the cork for and just ask a server to please recommend a wine? Well, you can do that on-island or off these days at two delightfully unpretentious places, both called Corks. Their venture began in Bluffton three and a half years ago, when they took the seemingly high risk of being the first business on the block in a space now known as the Promenade. Visit on a typical Friday night, and you would never suspect that during the build-out, Josh would head home wondering if anyone would show up once it was open. Others were wondering, too. “We were hearing a lot of people in Bluffton asking and questioning,” said Josh. “Does a wine bar belong in Old Town Bluffton, home of Bud Light and bourbon? It turns out Luman and Ferrell had no need to worry. Bluffton’s Old Town began to emerge quickly with the renaissance of Calhoun Street and the development of anchor restaurants like Captain Woody’s and Bluffton BBQ that surround the Promenade. The concept of a neighborhood wine bar fits right in among specialty shops and an overall laid back atmosphere in Bluffton. 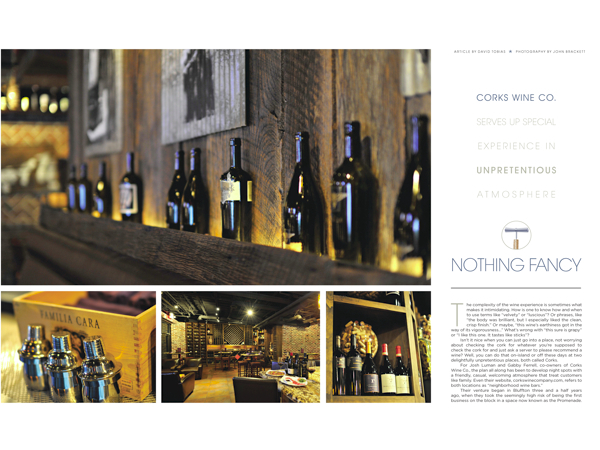 These days, almost any night, both Corks locations are hopping. Design elements that contribute to a homey feel were carefully chosen for both venues: concrete floors; exposed beam ceilings and reclaimed materials, like oak walls, rescued from an old barn in Georgia; local artist Pierce Giltner’s work, painted on old sheet metal; and a corrugated tin roof piece that fits quite nicely as a massive kick plate under the bar in the Hilton Head Corks. And then there are corks—thousands and thousands of corks, collected and stored in bags out back until Luman and Ferrell can find display options for them. Giant vases hold them, glass pedestals are filled to the brim with them and someone has even glued several hundred together to spell the name CORKS. That one ended up behind the bar on Hilton Head Island. It’s eclectic, but it all contributes to a general feeling of comfort and low key, which also happens to describe the co-owners to a tee. Luman and Ferrell are both from the southeastern Ohio river town of Marietta. They say they moved to the area for no rhyme or reason, seeking someplace warmer, mostly, wanting to be close to the beach but also close enough to visit parents once in a while or when needed. Ferrell had family in the catering business back home in Ohio and was familiar with that aspect of the business. But both were basically coming to Hilton Head Island cold. They worked for a handful of restaurants on the island to get their feet on the ground, but they both had their sights set on owning a restaurant early on. The success of the Bluffton Corks led to the opening of the Hilton Head Island Corks about a year and a half ago. Luman and Ferrell talk of very different clientele, and their reasons for starting restaurants on and off the island are also quite different. In Bluffton, Corks was one of very few specialty restaurants. On Hilton Head Island, it had to carve out a niche among a couple hundred. Its location is also very different, next to the south end Staples store, across the way from a Starbucks and just around the corner from a Publix grocery store in a strip mall just outside Sea Pines Center. If you don’t know it’s there, you may never find it. But Corks has dedicated regulars who have made it work and visitors who find out from friends who tell other friends. On Hilton Head Island, even among 200 or so restaurants, they feel they’ve found their place. There’s wit in their menu, too, with wines categorized as “blondes” and “redheads.” Luman says they’re trying to keep things informal and not be pretentious. They also buy locally, supporting the Bluffton Farmers Market. Corks offers as many as 100 wine options, as well as beer and wine flights for those who like to taste test a variety before deciding on a bottle. Corks’ staff, which consists of nine bartenders and wait staff plus Luman and Ferrell, all of whom work in both locations in a pretty free-flowing rotation, are free to recommend wines, not based on Wine Spectator rankings or reviews by wine connoisseurs. Instead, they can quite simply recommend what they like personally. But how do staff members know what they like? Luman and Ferrell provide insight into their management style by describing a recent staff meeting called to review the new bar list. Corks Wine Co. is located at 11 Palmetto Bay Rd. on Hilton Head Island and at 1297 May River Rd. in Bluffton. For more information, visit corkswinecompany.com. Call (843) 671-7783 for Hilton Head or (843) 815-5168 for Bluffton.